The Friends of Eddie Coyle (1972) is George V. Higgins’s great hard-boiled novel about a weapons dealer who turns informant and subsequently gets himself into a heap of trouble with his mob acquaintances for squealing on them. 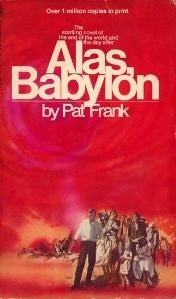 The book was a best-seller and was soon adapted into a terrific, compelling film by director Peter Yates, with Robert Mitchum as luckless Eddie and Peter Boyle as the “friend” who eventually gets assigned the grim task of rubbing Eddie out. If you have any interest at all in well-told crime stories, I highly recommend both Higgins’s novel and the film. Eddie’s essentially a small-time hood who gets in way over his head. His story shows (among other things) what happens when you try to operate as you normally would without recognizing you’re “out of your league” (to employ a much-worn cliché). Aside from those playing in the “Big Game” in Bobby’s Room at the Bellagio, most poker players are constantly wondering whether or not to take a shot at higher stakes. Particularly for those of us down here with the short stacks, just about any time we experience a decent run we wonder whether or not it might be time to try the next level up. If we’re human, that is. And like money. I’ve noted before how I mainly stick with either the $0.50/$1.00 or $1.00/$2.00 limits -- technically speaking the very bottom of the “low” limit games or (more accurately) the upper reaches of the “micro” games. I’ve arrived here after starting at the penny tables on Stars and slowly inching my way upwards through the various increments available online. I’ve come to understand (for the moment, at least) that I’m now where I feel most comfortable and where I win most consistently. I’ve taken occasional shots at higher stakes, although it has never gone particularly well for me when I have. I’ll win a little, break even sometimes, and/or lose a lot, eventually having to admit that the moves I’m encountering are either unfamiliar to me or put me off my own game too much to go on. It’s a bit like what happened in little league when the kids started learning how to throw the curve. Hitting had always seemed easy, then suddenly the ball kept disappearing on me. A few dozen strikeouts later and I knew my baseball career was over. The most important part of that quote, of course, is the phrase “everything else being equal.” When you move up a level, “everything” might seem “equal” for awhile, but that impression may well be due to your lack of understanding and/or experience at the new level. For me, moving up has never been as simple as just multiplying by two. Perhaps that’s due to my own limitations as a player, but I’d venture that most players who try to move up end up encountering a lot that is utterly new to them, thus forcing them to work even harder to comprehend what is going on at the table. George V. Higgins went on to write a number of books after The Friends of Eddie Coyle, and before his death in 1999 ended up producing several much-quoted lines about the human experience. Higgins once cleverly defined “egotism” as “the art of seeing in yourself what others can’t see.” As I've written about before, you have to spend some time analyzing your own game to succeed at any level, never mind to think about moving up. Games like Hold ’em and Omaha are “partial knowledge” games -- you know some things for certain (your cards, the community cards, the bets that have occurred), but there are other things you can only know imperfectly (your opponent’s cards, the significance of his or her bets, etc.). Yet only having partial knowledge of yourself makes the game that much more difficult. 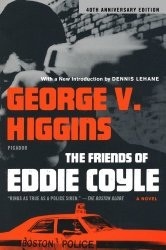 Image: George V. Higgins, The Friends of Eddie Coyle (1972), Amazon. You Have Options at Gamefisher Table! Been kind of a manic couple of weeks here. Looking back, I’m actually up about 40 BB total over the last fourteen days, although it doesn’t feel like such a triumph. The swings over that period have been dizzy enough to make a small-timer’s head swim (as much as 100 BB down & 80 BB up from where I presently sit). Normally don’t experience quite so much variance. Don’t like it too well . . . prefer to keep the heart pumping at its usual below-average rate. Why all the riot? I might plead extenuating circumstances. Was dealt aces no less than five times in a single (admittedly lengthy) session last weekend and had ’em cracked all five times. I knew it was happening, but had to check Poker Tracker later to confirm. In four of the five I was heads-up before the flop, including one where I lost to on a board of . . . . Dropped over 30 BB in those hands alone, plus probably suffered some tilty carry-over, I imagine. So maybe it was the cards. Another factor could well be fatigue -- I’ve been playing more (and longer) than usual lately while working off some of these summer bonuses, so perhaps the concentration is coming and going, thus increasing the likelihood of swings. Multitabling more often than usual may also be something to consider here. Being of limited intellectual powers, I generally can manage two tables, but tend to break down at three or more. There are several pros and cons to multitabling, and I’m not going to reiterate them all. I will mention one potential con, though, that occurred to me yesterday as I was sitting at one table debating whether to limp with A8-off from middle position (in a $1.00/$2.00 limit game) when I was simultaneously dealt AK-off in the big blind of the other (also $1/$2 limit). I was playing on Party Poker, where the countdown clocks, flashing screens, and “You Have Options . . . ” messages can scramble one’s thoughts when needing to make two decisions at once. I did what on the surface seems reasonable, folding the A8 and raising the AK, thinking at the time that I’d rather devote all my wits to the big slick hand than have to worry about other things while I did. I realized a hand or two later that it could well have been a mistake not to have played the A8 given the current table situation there (lots of tight players who did little preraising, who tended not to chase, and who would readily fold hands on the flop or turn). The AK hand had not been raised when it got to me in the big blind, but there were five limpers, all of whom called the raise. A flop of baby cards brought a raise and reraise that forced me to let the hand go. As it turned out, it was actually a simple hand to play, requiring very little brain power. Meanwhile I may have missed an opportunity on the other table (although I cannot recall how that particular hand played out without me). Even the Einsteins who can run over several tables at once will admit that multitabling invariably lessens one’s ability to gather information and make correct decisions. Doing so also subtly affects the criteria by which you select starting hands, even if you don’t necessarily realize it’s happening. A lot of young gunners talk about being on “autopilot” when playing on several tables online. Indeed, during today’s installment of CardPlayer’s The Circuit, online-poker phenom Shane Schleger used the term to describe his online play (while contrasting it with his approach to brick-and-mortar poker). “Autopilot” surely works well for some, perhaps including the capacity to vary one’s decisions according to situational differences. Not so much for the feeble-minded like yours truly, though. Too many miles on this old jalopy. As the Firesign Theatre once famously asked, how can you be in two places at once when you’re not anywhere at all? 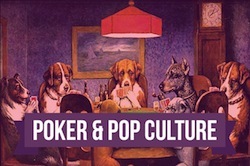 “The Case of the Clichéd Players” generated a thoughtful discussion on the Card Clubs forum that was continued on the show once the hosts played the second part of the OMM. An issue that arose -- really the main issue of significance, I’d say -- concerned the quality of play in online, low buy-in, multitable tourneys. In the hand, Columbo faced what appeared to be some very loose, very questionable betting and calling before and after the flop. Having to make a tricky post-flop decision, Columbo decided he was up against a couple of inexperienced and/or inexpert players and so acted accordingly. It turned out well for him, with his correct assumption that his two opponents were playing the hand poorly allowing him to triple up. The OMM and the discussion surrounding it got me thinking a bit about how easy it is to underestimate one’s opponents at the table. I essentially agreed with Columbo’s cogitatin' in this here situation -- the minimum raises and calls of big bets by his foes did seem to indicate the likelihood that he was up against some untutored adversaries. It is easy, though, to fall into the trap of “assuming the worst” about the level of one’s opponents’ abilities, especially in these low buy-in tourneys or in low limit cash games. I know I’m guilty of making such assumptions -- sometimes on scant evidence -- and usually end up paying the price when an apparent donk turns out to be more crafty that I had realized. In some of my recent posts I may have given the impression that I’m the only sane one at a table of lunatics -- that all of the other players at these low limits are operating at less than full capacity, thereby giving me the right to sit back and judge their awful play. Such is hardly the case. Looking back at the three hands I shared in “Life in the Land of the Blue Chips,” I can certainly question the level of my own thinking in a couple of instances (particularly “Hand 1” where I recklessly ride big slick to the bottom of the river). While those hands all certainly demonstrate some unorthodox play, none of them can be taken as irrefutable evidence that those involved (even me) are bad players. Indeed, the fellow in “Hand 1” (Underpants) who preraised with 82-suited could well have been pursuing a simple blind steal, was caught (with his pants down, so to speak) by my BB reraise and had to call, then fortunately flopped two pair and turned the boat. If I proceed from that point assuming he’s preraisin’ with any ol’ suited crap, I’m likely gonna be donating even more to his stack. Notice that the authors are not saying to assume you are up against bad players -- rather, they say to assume you are up against loose players (implying, perhaps, that one or two or more might in fact be “poorly-skilled” enough to pay you off if you time things well). When I first arrive at a low limit table I try to follow the trio’s advice and assume it’s a loose table, but also try to avoid assuming the players are clueless. In fact, I attempt to give them all credit for knowing what they’re doing -- again, until they make a play that cannot possibly be interpreted as an intelligent one. In truth, I usually find it better policy to assume the worst about my own hand -- not about my opponents’ abilities -- and let folks showdown a few bottom pairs or busted draws to me before concocting any overly-elaborate theories about them. If you haven’t done so, do check out Card Club and the OMMs. I always liked the Columbo TV series, where “who done it” was usually less of an issue than how it was done (and how Columbo is going to figure it all out). We all know the murderer will be caught in the end, so the result matters less to us than the process by which the result was achieved. The OMMs tend to operate similarly. It (usually) doesn’t matter so much how the hands turn out; what matters is process, that is, the thinking that leads to -- hopefully -- correct decision-making. And a big part of such correct decision-making is not assuming your opponents all think they’re playing blackjack. 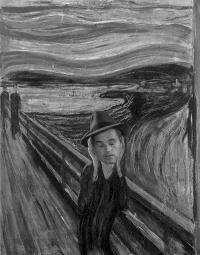 Image: Edvard Munch, The Scream (1892) and Tom Neal from the 1945 film Detour (adapted), public domain (both). 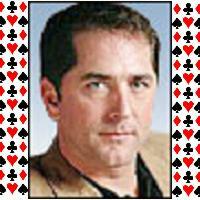 Low limit poker players are also, in their own way, amateur criminals. We try to deceive and mislead and out-clever each other. Sometimes we get away with it. Sometimes we give ourselves away. One of the worst mistakes we can make is the same one Albury makes -- to talk too much. With every word we offer free information about ourselves. Not to mention divert our attention in potentially detrimental ways. 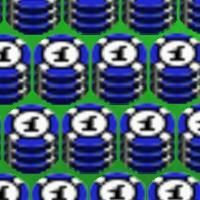 When I first started playing online for play chips, I greatly enjoyed the socializing that went on in the chat box. Made some fast friends there. Even met one in Vegas last year when we both happened to have trips planned at the same time. Once I moved over to real money, though, I quickly discovered fewer players seemed interested in the barbering. I soon lost the urge to engage others, and now largely avoid the commentary altogether. Sure, I’ll concede a good play with a “gh” now and then. Mostly I’ll zip it, though, keeping dormy and letting the cards do all the conversatin’. I realized this week how non-purposeful the jabber can be when I sat down at a table on PokerStars and saw a fellow whose screen name included “Fjodor” sitting to my right. On Stars, of course, you get to upload a picture for your avatar, and his icon happened to be the head of Dostoevsky, taken from the same famous painting of him by Vasily Perov that I had included in an earlier series of posts about one of the Russian writer’s novels. After ten hands or so, I couldn’t resist and so typed in the chat box “hey Dostoevsky . . . just read The Gambler.” No response. Did he speak английско . . . ? I think his hometown may well have been in Russia, actually. In any event, for some reason talking to Fyodor inspired me to chat more than I usually do during the day’s play. No lengthy conversations, just things like asking a player from Jackson which state he was from or handing a good-natured dig to the fellow who cracked my kings with 42-offsuit. By the end of the day I had broken even, but felt certain that I’d played less well because my concentration had been scrambled unnecessarily by all the banter. I know some players can handle the chat and in fact make it a fairly significant part of their game. Not me, though. I gotta remember to button up. Save the “frank and open business” for the blog. Less apt to get me in trouble there. 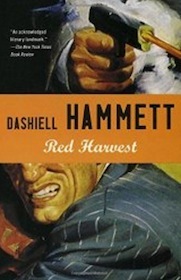 Image: Dashiell Hammett, Red Harvest (1927), Amazon. In my previous post I referred to the “land of the blue chips,” i.e., the low limit tables where we’re mostly playing with the blue one-dollar chips. As anyone who spends any time down here knows, the quality of play varies tremendously. Ultimately (as is true of any limit, I'd venture to say), it all depends on who comes to the table. Some are crafty, clever players. Some seem unsure a full house beats a flush. Not too different from the rest of the world, basically. You got your smarties and your dumdums and then all the rest of us poor lugs in between . . . .
Had an odd run of hands yesterday while limping through a particularly vicious losing session of $1.00/$2.00 limit (full table). A higher than average dose of bizarro, it seemed. The hand of the day undoubtedly came when I called an early raiser with my threes in the cutoff and we ended up heads-up. Flop came 6-2-3 and we capped it. Turn was another 6 and we capped again. River was a third friggin’ 6 and he took it down with 99. I’m in the BB with As Kh. Droopy calls from UTG+1. Underpants raises from UTG+2. The table folds back to me and I bump it up hoping to get rid of Droopy. Droopy’s going nowhere, though, and calls. Underpants calls as well, so there are 10 small bets in the pot when the flop comes a raggedy 2c 7s 8c. I make a continuation bet, Droopy calls, and Underpants (the original raiser) raises. I put him on an overpair and call, as does Droopy. The turn brings the 8d, pairing the board. I check to Droopy, thinking he could well have an eight here. Droopy checks, however, and Underpants again bets out. I decide to take the 9-to-1 odds and make the call. The river is the Js. I’m 90% sure I’m beat, but make a crying check-call nonetheless and show my crummy ace high. Underpants turns over his hand and, indeed, I am beat. But not by the hand I thought. What does he have? 2s 8s, of course. I’m UTG with As Ks and open with a raise. All fold except the button (PourquoiPas) who cold calls and the BB (MoiAussi) who completes. There are six small bets in the pot. Flop comes Ah 8s Td. I bet and both of my opponents call. Turn is the 7c and we replay the same sequence (I bet, both call). River is the 6c and I bet again only to have PourquoiPas raise me and MoiAussi cold call the raise. With better than 13-to-1 I have to call and so I do. We show ’em down. I got my aces. PourquoiPas has 9h 4h for a straight. MoiAussi’s Kd 9s also makes him a straight. They chop the pot. After watching the UTG (CrazyLarry) call, I call from the cutoff with Qs Jh. The button also calls, the SB folds, and the BB checks. So we’ve got four players seeing a flop that gives me top pair, okay kicker -- 4s Jc Ts. CrazyLarry checks, I bet, the other two players fold, and Larry calls. The pot is a modest six small bets when the turn brings the Ad. CrazyLarry again checks. I pause a beat and decide to bet out, and CrazyLarry once again calls. The river is the innocuous 2h. CrazyLarry checks, I bet, and he surprises me with the check-raise. The ace, maybe? I call. Are my jacks good? Heck no. CrazyLarry has 5h 3d, giving him a wheel. Yesterday I’m once again riding along in the slow lane of a nice, quiet game of $1.00/$2.00 limit hold ’em (full table). Let’s face it . . . I’m a low limit hack. I used to alternate between NL and limit on a regular basis. Then about six months ago I realize I’m going back to the limit tables more and more often. Now I’m always there. Kind of like the alky who finds himself leaning up against yet another brass rail, raising yet another shot, not really sure of having consciously decided to be there . . . . I suppose I’m getting older. Limit is obviously less volatile, more predictable. More a fuel-efficient, two-seater Honda than the “Cadillac of poker” (as Texas Dolly describes NL Hold ’em). So there’s one appeal for your risk-averting, humble servant. I’m also a numbers guy, really, and so tend to find interesting humdrum things like the fact that in Hold ’em you always have a 1 in 17 shot at being dealt a pocket pair. Or you’ll complete your flush by the river about 6.5% of the time when dealt two suited cards. You know what I’m talking about. Poindexter stuff. Anyhow, there I am. After three orbits or so I’m sitting in the SB with my stack exactly two bits larger than it was when I started when I’m dealt Ah 2h. It folds to a dude in middle position who calls, then the rest of the table folds back around to me. I complete the bet, the BB checks, and the three of us see a flop of 4d As 8d. I go ahead and bet to try to get an idea here, the BB folds, and the limper -- let’s call him Tortuga -- puts in the raise. Now I figure Tortuga for a number of possible hands here, including a better ace, a hand with an eight in it, or a flush draw. I call and the turn comes 4c. Feeling a little randy, I bet to represent trips and Tortuga waits a bit before raising. I’m fairly sure he doesn’t have the four. No, I’m thinking there’s about a 70% chance he has a better ace. But there’s some chance he doesn’t, as well as the possibility of a split pot, so I stubbornly call. The river is the Js and I check-call only to be treated to the sight of Tortuga’s pocket rockets. With his aces full he takes down a pot of 9+ BB ($18.25, to be exact), $9 of which I contributed. Salt in the wound comes when a couple of others offer their “nhs” to Tortuga by way of approval, who responds by quickly exiting the premises. Perhaps at the higher limits one sees this sort of thing more frequently -- limping w/AA with an eye toward reraising when someone in late position tries to steal. Doesn’t happen so much down here in the land of the blue chips, however. In fact, at these low limits, I can’t really think of a single situation where one shouldn’t preraise w/aces. Perhaps when it's blind-vs.-blind and you’re worried that a raise might end the hand preflop, although even then I dislike not raising since raises from the blinds can be interpreted in so many ways other than representing a premium hand. Before he left I was able to make a quick note on Tortuga (“no preraise w/AA, mid. pos.”), not to warn myself that he may have aces when he limps preflop, but as an alert that this here dilly will make an unorthodox play. Such folderol stands out like a sore thumb at the low limits, where most players play a similar, conventional style. When I checked Poker Tracker later I saw that Tortuga in fact did not raise preflop a single time in the thirty hands I played with him. He also ended up exactly $1 ahead for the session. A small sample, but it seems preraising probably ain’t a big part of Tortuga’s arsenal. Also seems he was satisfied to have recovered from me some of what he’d previously lost before deciding to make tracks. I always feel profoundly ambivalent after losing a hand this way, a great big “whatever” hanging over my seat like a dreary cloud. So I fell into the trap. But in order for it to have worked in this particular hand, Tortuga really needed to flop the case ace (or perhaps a flush draw for me). Even if I weren’t a numbers guy, I’d know that flopping a single card like that is not very likely. (Since I am, I figure it out by adding the chances of spiking the ace for each of the three flopped cards: 1 in 50 [2%] + 1 in 49 [2.04%] + 1 in 48 [2.08%] = 6.12% or about 1 in 16.) Of course, if I’m holding any Broadway card and pair it on the flop, he’s likely gonna cash here as well, although again, the chances are against that happening. As I’ve written about before, AA can be a problem hand. But it seems to me one way to make it less of a problem (in low limit Hold ’em, anyway) is to play it straight preflop and raise it like the sensible Honda driver you are. As the young'ns like to say, that’s how I roll. Kenna James is a Very Funny Fellow Right! Damn lot of reasons to like professional player Kenna James. One, he’s a riot. The “singing cowboy” never fails to entertain. His Elvis impersonation is also worth the cover. Two, he’s clearly a selfless, caring guy, promoting charities like the Wounded Warrior Project and making friends wherever he goes while on tour. Three, he’s a player. 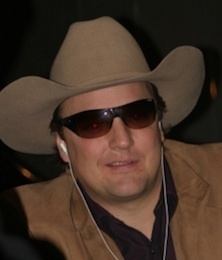 The former actor started out working as a dealer and playing $1.00/$2.00 limit back in the mid-’90s at Hollywood Park Casino. He slowly worked his way up to the higher stakes, a move aided in part by his marriage to another pro, Marsha Waggoner. After a few years of grinding he finally won an event at the Hustler Casino in 2002, then made an amazing 18 final tables in 2003. He finished second in the WPT 2005 Legends of Poker (a $5K NL event), has cashed in nine WSOP events, and is currently in second place in CardPlayer magazine's Player of the Year points race. So the funny man making friendly and goofing around at the other end of the table is more dangerous than he looks. The main reason why I bring him up, though, is that after hearing him interviewed on a couple of podcasts recently (Ante Up! and CardPlayer's The Circuit), it turns out he’s also someone who despite all the clowning is remarkably articulate when it comes to describing what makes a good poker player. I recommend both interviews. 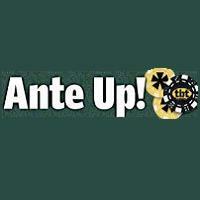 The Ante Up! one (which appears in the episode titled "The guys celebrate a year together") is probably more full of yuks while the Circuit interview contains more practical wisdom. Three pearls that James casually drops while laughing with Scott Huff, Gavin Smith, and Joe Sebok on The Circuit are . . .
1. If you find it difficult to move beyond Sklansky and loosen up as a player (e.g., starting hand selections, semi-bluffing, etc. ), try not to think of what your doing as “loose” but rather as “creative.” If being creative is not one of your strengths -- in poker or in life -- find someone who is creative and try to emulate that person. 2. Like creativity, empathy is another desirable quality for a poker player. Remember, empathy simply refers to identification with another’s situation or feelings or motives. (People often confuse empathy with sympathy, which refers to sharing another’s feelings -- e.g., feeling sad when someone else feels sad. Indeed, on the show the group repeated this mistake and laughed about “feeling sorry” for your opponent just before you crush him.) James explains that if you can identify with your opponent’s situation, you’re going to be better able to make reads at the table. Ask yourself what factors influence his decision when trying to interpret his or her actions. Again, this is something one can work on in one’s non-poker life as well. 3. Writing about poker is another way of becoming a better player. James talks about how when he writes about “the basics” or “the fundamentals,” describing even the simplest aspects of poker to an audience, he is not simply writing to other people but is also writing to himself. In a way what he’s saying is analogous to the axiom that there is no better way to learn something than to try to teach it to someone else. Such advice rings true, I’d imagine, with anyone keeping a poker blog. We write about these things to share them with others, but also to sort them out in our own muddled heads. As both Sebok and James point out late in the interview, whenever James talks about poker he’s always also talking about people and relationships -- all that he professes about the game proves that for him improving as a poker player also means improving as a person. A lot going on under that ten-gallon hat, I’d say. Had an eyebrow-raising session of 6-handed limit ($0.50/$1.00) a few days ago. Wasn’t all that full of fireworks in terms of the actual play. I was, however, witness to what turned out to be a mild form of cheating at the table -- not outright collusion, mind you, but (as I later learned) an example of “unethical” play that violated the rules and regulations of the site (Poker Stars). The guilty were notified and duly warned. How do I know? Because I’m the bruno who ratted on them. Eventually I plan to write something about the differences between short-handed (e.g., 6-max) and full-tabled limit. One generalization I’ll offer here is that at the short-handed tables one is usually able more quickly to read other players’ tendencies. Especially at the lower limits -- from which I only occasionally stray -- it usually only takes an orbit or two to divide folks into three categories: those who have a clue, those who don’t, and those who have a clue but act at times (either deliberately or otherwise) as though they don’t. At this particular table sat one from the latter group, a fellow I’ll refer to as Peacock. When I arrived at the table, Peacock was congratulating another player, GollyGee, for having won a previous hand. The banter continued during the first few hands, with the occasional contribution of a third voice, a rail-sitter observing the action, Snoopy. I only gunned for a couple of pots during the first dozen hands or so. Then I saw Peacock reraise a preflop raiser and then subsequently win a hand showing down T6-suited. A little loose, I thought. I saw him preraise a few more times, usually when he had position, and take down a few more small pots. I was starting to think I had a read on this bird when the following hand took place. I was sitting at UTG+1 when I was dealt Qd Qh. I raised and the table folded around to Peacock who called me from the BB. The flop came Js 2c 7h and Peacock bet. I raised, he reraised, and I just called. The turn brought the 8s and the same betting sequence (Peacock bets, I raise, he raises, and I call). Now I’m convinced he’s got T9 and has me beat w/his straight, or perhaps J8 and has paired his kicker. The river brings a blank and I make a crying call to discover he’s taken down a handsome-sized pot ($13.25 after the rake) with good ol’ seven-deuce. I didn’t begrudge him any. I’ve pulled similar pranks myself (I wrote about a similar one in an earlier post), and so rather than complain I simply typed “the hammer” as an acknowledgement of his triumph. He didn’t respond, but rather continued back-and-forthing it with GollyGee and Snoopy. Needless to say, Peacock now had my undivided attention. He continued with the wild preflop behavior for awhile. Eventually I recouped most of my loss after being dealt queens again, this time beating Peacock when after a bit of bluster he folded on the river. Was about that time things went a little cuckoo. After preraising yet again, Peacock was in the midst of duking it out with GollyGee when Snoopy (the rail-sitter) types “J7 clubs.” Come showdown, Peacock indeed has Jc 7c. Then another hand comes, again involving Peacock and GollyGee, during which Snoopy types “pocket sixes.” Once again, the showdown reveals Snoopy has correctly identified Peacock’s cards before they were made known to the rest of the table. That’s when I suddenly didn’t feel like playing anymore. What would you do here? Look for greener pastures? Call a copper? No one likes a stoolie, but this here’s real dough we're playing with (even if the stacks are short). My dough. GollyGee seemed unaware that anything untoward was occurring, blithely typing things like “how do u do that?” and “u got 2 computers?” to his new friends. I watched the flimflam a short while longer, then made scarce. I decided I was gonna give ’em up and how. I fired an email to Stars’ support describing what I’d seen. I then went back to the scene (as an observer) and noticed Peacock had left, but Snoopy had taken his seat and was playing the same erratic style, less successfully, as had Peacock. In less than two hours I received not one but three emails from Stars support (which has always been first-rate in my experience). The first promised to investigate, the second reiterated their concern, and the third conveyed their findings. It was determined (correctly, in my book) that while collusion had not taken place, there was “unethical play,” with both players violating a couple of Stars’ rules for cash games. One rule concerns sharing of information. The other is akin to the “one person per hand” rule that governs most poker games (actually listed among their tourney rules). I was told that the pair would be notified and that some “preventative measures” would be put into place (although I’m not clear what those measures actually were). I was satisfied Stars’ support took seriously my beef (I had told them I didn’t feel comfortable playing at a table where an observer knew one of my opponents’ hole cards). The likeliest play-by-play pegs Peacock and Snoopy as just a couple of cronies who get their kicks instant-messaging one another while playing. Of course, the pair could’ve easily avoided the chitchat, sat down at the same table, and put their shared dope to use while playing. As it happens, according to Stars’ support, Peacock and Snoopy had never played even a single hand at the same table. Which to me spells out they’re just a couple of juvie-type goons who were having a little small-timer fun with GollyGee the greenhorn. Hardly hardened criminals scoping out a big score. I’m also mostly convinced that Stars and the other major sites are on the lookout for any similar monkey business. I know at least some of the larger sites track this sort of thing constantly, searching for sketchy-looking patterns (e.g., players who frequently play together). Still, the experience was something new to me. I’m hopeful others who witness such chicanery play good citizen and let the authorities know about it, but I know better. The world doesn’t turn that way. I suppose the lesson here isn’t for most of us, but for the wise guys -- there’s rats all over the place, so watch the cheese. One last thought about Fyodor Dostoevsky’s The Gambler and how it relates to the poker player’s experience. Not to worry. Tomorrow I’ll be saying sayanora to the book club for awhile and get back to the friggin’ tables. 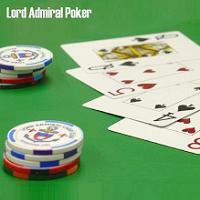 I previously discussed a couple of other ideas from the novel that might be interesting to poker players. The first involved how the novel successfully dramatizes a common fallacy in poker whereby we believe that the way the cards are dealt in one hand has something to do with the way they will be dealt in the following hand. Miller/Sklansky/Malmuth humorously remind us that “Cards are pieces of plastic. They have no knowledge, no memory, no cosmic plan.” The Gambler also conveys this truth about the roulette wheel, although we see in the novel how even those characters who understand this still sometimes act as though they do not. The second idea concerned the way playing poker tends to consume our thinking to the point that we forget about past and future and live as though only the present moment is of any consequence. Again, characters in the novel vividly portray this phenomenon. In that post I concluded that such living only in the “here and now” doesn’t necessarily have to be a bad thing, particularly if understanding this helps you concentrate on your decision-making at the table (and doesn’t wreck your life as happens to Alexey Ivanovitch). Now, at first glance it might appear impossible to believe that we can have both of these desires at the same time. After all, how can one be “in control” while at the same time not be responsible for one’s actions or the actions of others? Let me try to explain how this seeming contradiction works in the novel while also relating how it plays out at the poker tables. Alexey is clearly self-deluded about how much “control” he actually can have when playing roulette. He can control whether or not he plays, of course, but he cannot control whether or not he’ll win. Nevertheless, I think Alexey here exemplifies the poker player’s experience to a degree when he comes to the table knowing “for certain . . . that [he] should not leave . . . unchanged.” Even if a poker player plays two hundred hands and leaves with exactly the same amount of money with which he began, he will not be unchanged. Thus does playing poker strangely allow us to exert a kind of control over ourselves (and, at times, over others) that we normally don’t possess. In fact, one might define poker as an activity in which each participant is trying to exert the most control in situations where everyone is a little out of control. We succeed sometimes. The best of us succeed more often than the worst of us. But even terrible players get to taste such control every now and then, thus satisfying a desire that all of us sitting around the table likely have at least to some degree. For all his talk about defying fate, however, Alexey appears equally desirous to give up himself to the spin of the roulette wheel. Having personal responsibility over oneself is such an enormous burden we sometimes want (like Alexey) to let it go and yield ourselves entirely to some other authority (perhaps greater, perhaps not). Gambling -- like religious faith, actually -- provides for many an opportunity to relinquish such responsibility. Frequently in the novel Alexey shows how much he wishes not to be responsible for himself, for instance when he willingly assumes the role of “slave” to Polina. Since he isn’t accountable, things like “good” and “evil” no longer matter to him. “I don’t even worry my head about moral qualities of any sort,” he says early on to Polina. “I see nothing but you everywhere, and all the rest is naught to me.” Gambling produces a similar effect upon Alexey. 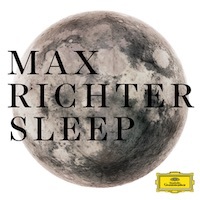 At the end of the novel he admits “I even dream of playing.” Again, “all the rest is naught.” He’s beyond good and evil. He’s able to exist without a will of his own. I’d suggest that playing poker satisfies a similar urge for most of us as well. There is something thrilling about not being entirely responsible for what happens at the tables. We all want to win, of course, but when it happens that we’ve flopped a set and someone unreasonably stays in the hand to make a one-card flush on the river, we know we aren’t to blame. What sweet relief not to be held accountable, even when things go wrong! As I’ve said before, most of us aren’t as extreme in our relationship to gambling/poker as Alexey is in The Gambler. For most of us these desires -- to exert control and to relinquish personal responsibility -- are satisfied at the poker table but only in a temporary way. Most of us readily go back to our “real” lives where our control is limited and our personal responsibility considerable. There are other items of interest in the novel, and I do recommend it to any poker player. It’s summer time, though . . . I need to put down this book and relax a bit. Find me a game. Where’d I put my beer? 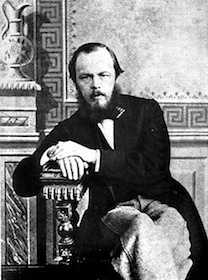 Image: Dostoyevsky in Paris, 1863, public domain. A second phenomena explored by Fyodor Dostoevsky’s The Gambler concerns the way the game -- be it roulette, poker, or any other contest that involves gambling -- has the potential to consume us, causing us to forget about everything else. What I’m suggesting is that when we play poker, the past and future tend to mean less to us. The present is all. In The Gambler, whenever Alexey Ivanovitch goes to the casino to gamble he tends to experience a kind of “transcendence” while playing -- a sort of euphoria, actually, that causes him not simply to lose track of time, but to lose his sense of self. Toward the novel’s conclusion, Alexey has trouble recounting the details of one frenzied session of play: “I don’t remember my winnings after, nor what I staked on. I only remember as though in a dream that I won . . . but I scarcely felt anything as I did so; I simply waited [for the next turn of the wheel] in a mechanical, senseless way . . . .” When Alexey plays, it is as though nothing else exists for him. Everything -- the past, the future, all of his relationships with others -- falls away as he waits “mechanically” to see where the ball will land. In fact, during this particular session he has entirely forgotten his reason for having come to the casino in the first place -- to win enough to pay off the debts of a woman, Polina, with whom he is obsessed. While leaving the casino with his winnings he realizes “I hardly remembered what she [Polina] had said to me earlier, and why I had gone.” Later on another character, an Englishman named Mr. Astley, has to tell Alexey that Polina was in love with him all along, yet his having become consumed with gambling caused him not to recognize this fact. Mr. Astley accuses Alexey of having relinquished everything to the perpetual present of roulette: “You have not only given up life, all your interests, private and public, the duties of a man and a citizen, your friends (and you really had friends) -- you have not only given up your objects, such as they were, all but gambling -- you have even given up your memories.” Alexey’s reply is rich with irony: “Enough . . . please don’t remind me.” He doesn’t want to be reminded about his past -- even that he has a past. Rather, the game is all. Of course, not everyone who plays poker is as troubled as Alexey. Most of us don’t allow the game to consume our lives as thoroughly as he does. I would suggest, however, that all of us experience this sort of “transcendence” at times when playing, those moments when we find ourselves simply waiting in a “mechanical, senseless way” for the next card to come. These moments come most frequently during the latter stages of particuarly lengthy sessions, I’d venture, although they can come at other times, too (such as during a wild “rush” of cards or a sequence of large pots in which one is frequently involved). As happens with Alexey, our minds momentarily trick us into forgetting all else and giving ourselves over to the here and now. That may well be one of the greatest appeals of poker, the way it continually provides us new problems to try to solve. (If one views these poker problems as eclipsing in importance other “problems” in our lives -- as happens with Alexey -- then one has a much greater problem, of course.) In any event, this momentary “forgetting” of ourselves relates to a couple of other issues that come up in The Gambler that I’ll discuss in my last post on the novel, namely, how poker strangely satisfies contradictory desires to control one’s life while at the same time relinquish responsibility over it. Image: Fyodor Dostoevsky, The Gambler (1866), Amazon. As I mentioned before, I want to discuss three ideas of interest to poker players that come up in Fyodor Dostoevsky’s The Gambler. The first concerns the human tendency to see patterns where they don't exist. Alexey Ivanovitch is not the only character in The Gambler who becomes obsessed with roulette. Other characters are shown succumbing to the lure of the wheel, the most colorful being Granny. Granny is the grandmother of the family for whom Alexey works as a tutor, and for the first half of the novel most members of the family appear impatient to see Granny die and leave them her estate. Without warning, Granny suddenly appears in Roulettenburg -- in good health, at that. She’s a bit eccentric and certainly enjoys the discomfort she has produced by appearing so unexpectedly. After losing three times running, Granny decides to stake two friedrichs d’or and the zéro hits. Much to Alexey’s dismay, she bets as much as is allowed on zéro again and loses. Undeterred, she bets on zéro yet again. “Zéro!” cries the croupier, and once more she’s won a bundle. Alexey describes how he felt upon realizing the zéro had hit three times within a dozen turns: “I felt that at the moment my arms and legs were trembling, there was a throbbing in my head.” Granny puts the bulk of her winnings on rouge, wins again, then announces “That’s enough! Home! Wheel my chair out.” All told Granny had staked five friedrichs d’or and was now leaving the casino with about 220 times that, an amount nearly equal to that of her entire estate. There are a few different ideas present in this episode familiar to poker players (e.g., running well, playing one’s rush, boldly taking risks, hitting longshots, etc. ), but the one I find most interesting concerns Alexey’s claim that since the zéro had recently hit it was less likely to hit again in the near future. Earlier in the novel Alexey describes players who “sit with papers before them scrawled over in pencil, note the strokes, reckon, deduce the chances, calculate, finally stake and -- lose exactly as we simple mortals who play without calculations.” Alexey instinctively knows these players are self-deluded. He knows that one turn of the wheel has no bearing whatsoever on the next. Nevertheless, he still advises Granny against betting on zéro since it had so recently hit. In Small Stakes Hold 'Em, Miller/Sklansky/Malmuth discuss the tendency for poker players to believe how the cards are dealt in one hand actually affects how they will be dealt in the next hand. “The human brain is terrific at identifying patterns,” they point out, though sometimes -- especially when playing poker -- “people see false patterns that they believe are real.” “Most gamblers,” they claim, “tend to ascribe meaning to purely random, independent events.” Have you ever (like Alexey) allowed the appearance of such false patterns affect your thought process during a given hand? If you are human, you probably have. Just today I had newly arrived at a $1/$2 limit table where I was dealt Jh 3c in the BB. A late position player raised, the SB called, and after a moment I decided to let it go. Sure, I’d be getting 5-to-1 by calling, but I knew zilch about the other two players. Besides, I didn’t want to get in trouble here on my first hand and thereby create an unwanted table image from the get-go. I folded and watched as the flop came 9h 3s Jd. The SB called bets on both the flop and turn, then after an Ace came on the river fireworks erupted and the pair capped. Both had big slick and so chopped a huge pot -- $25 or so -- although they ended up only coming out even on the hand after the $1 rake (precisely what I had put into the pot). Nonsense! (As Granny would say.) 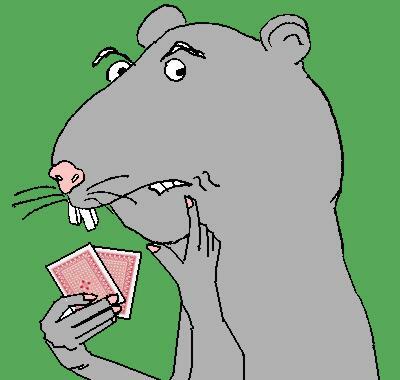 Miller/Sklansky/Malmuth say the same thing in a different way: “The cards dealt on any poker hand are, for practical purposes, completely random and independent of the cards dealt on any previous hand.” The odds of my flopping two pair hadn't changed an iota. They remained about 1 in 49 -- the same as every other hand where one holds two unmatched cards. In my next post I'll say something about how The Gambler illustrates another “mind game” poker players often experience, namely the way the game can cause us to shut out past and future and live only in the moment. 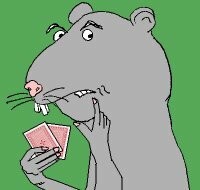 I thought of that cartoon last week as I read Fyodor Dostoevsky’s The Gambler -- one of the 19th-century Russian novelist’s lesser known novels, although certainly his most popular in the poker world. References to The Gambler pop up in many poker books, particularly “literary” ones like Anthony Holden’s Big Deal, the late David Spanier’s The Hand I Played, and James McManus’s Positively Fifth Street. The novel is set in the fictional German city of Roulettenburg -- kind of a 19th-century European version of Vegas -- where the main character, a tutor named Alexey Ivanovitch, unsuccessfully battles his obsession with the game after which the city is named. There is one card game that comes up occasionally in the novel, a game called trente et quarante (a.k.a. rouge et noir) that is essentially a kind of roulette using six decks of playing cards rather than a wheel and a ball. (You can still get a game of trente et quarante in Monte Carlo, apparently.) However, roulette is the game that Alexey plays the most, and that’s the game about which Dostoevsky (himself a roulette addict) has the most interesting things to say. Anyone at all serious about poker will be quick to point out that poker ain’t roulette. Some go so far as to distinguish poker from gambling altogether, insisting that it’s a skill game wherein the better-equipped players always win out over time. I like how Miller/Sklansky/Malmuth treat this subject in the opening sections of Small Stakes Hold ’em. They assert that, in fact, “poker is gambling,” and the schmo who says it ain’t “does not understand poker as well as he should.” Poker is gambling because it always involves some measure of uncertainty, particularly with regard to the cards. Sure, at times we might be uncertain about our opponents’ play or holdings, but better players eventually can get a line on those things. Yet even the very best poker player cannot get a line on precisely what card is gonna come on the turn or river. (Raise yer paw if you’ve also lost a 20+ BB pot to a river one-outer . . . . There we go.) So while in poker you can (as Miller/Sklansky/Malmuth explain) play in such a way so “that your expectation can be positive,” when you play poker you’re still gambling. That's why The Gambler ultimately touches on so many concepts of interest to poker players. As a way of responding to the book, I thought I’d focus on a few ideas related to gambling that come up in The Gambler that might be of particular interest to poker players. I’ve pulled out three ideas or concepts, all of which could be made to relate to the “psychology of poker” -- that is, all three concern how our minds work (and, at times, fail to work) when we play. The first has to do with how a particular sequence of hands will affect our thinking regarding what comes next. The second involves the way the game tends to consume us, causing us to forget about everything else besides the “here and now.” The third has to do with issues of control and personal responsibility, and how poker (or any form of gambling) strangely satisfies certain, contradictory desires most of us seem to possess. I’ll discuss these ideas in separate posts over the next few days. Afterwards you can decide if you want to check out The Gambler yourself. 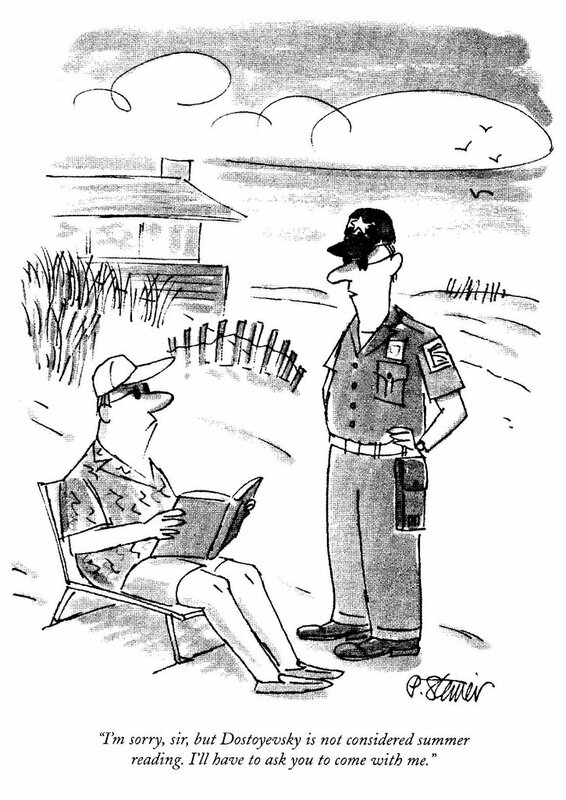 Of course, you’ll want to keep one eye out for the summer reading cops if you do. 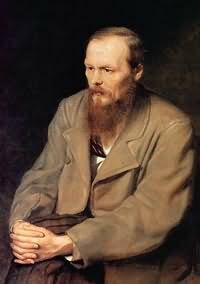 Image: Vasily Perov, portrait of Fyodor Dostoevsky (1871), public domain. So Mike Hammer tells that young punk Hal Kines early on in Mickey Spillane’s I, the Jury. Such a tactic is familiar to anyone who remembers the playground, where a standard ploy for dealing with bullies is to show them aggression. Having seen so many back down from them before, they often become unsettled by such demonstrations of strength and will back down themselves. Such is the advice we also frequently hear for dealing with overly-aggressive poker players -- wait for the right moment, then come back “over the top” and watch him scurry away as you gather his chips. Of course, most of us aren’t badasses like Mike Hammer. That means whenever we do grit our teeth and try to bully the bully, we are essentially playing against our true natures. In this situation, if you are normally a conservative player (like Harrington), you find yourself temporarily having to play an unfamiliar role in the hopes of creating a favorable outcome for a particular hand (and perhaps affecting future play by demonstrating to the table that when playing with you they aren’t “dealing with somebody soft”). This kind of performance is much easier said than done for most of us, I’d venture. In a NL tournament (the primary context for Harrington’s advice), opportunities to “drop the Hammer” can come infrequently, making it all the more crucial to be successful when the time comes to do so. Let’s say you are in a tourney and for the last 4 or 5 orbits a super-aggressive player has been raising preflop anywhere from 2x-4x the BB approximately half of the hands. You’ve seen a couple of showdowns where he’s had to reveal holdings like QT-offsuit or 65-suited, so you know his range of raising hands is damn wide. You’d know that even without having laid eyes on the samples, of course -- no one ever picks up premium hands half the time, even for a single orbit. Now you’re sitting there with a below average stack and you’ve become gripped with the notion that dropping the Hammer on this guy is for you both a desire and a necessity. Like Mike Hammer, who can’t proceed with his investigation until he deals with the Kines kid, you know you probably won’t get much further in the tourney until you deal with your adversary. 1. You have a “reasonable” hand. You can’t move in here without packing some kind of weapon with which to fight. You needn’t necessarily have a loaded .45, but a nice-sized cudgel will do. What constitutes a “reasonable” hand is entirely up to you, but it has to be a hand with which you won’t fear a call. Any hand (except kings or aces) fears a reraise, but you should have a decent range of hands that you can play with confidence here if called. If the hand isn’t strong enough for you to withstand a call from the bully, don’t try the move here. 2. You have position. Unless you’re planning an all-in move (thereby negating the significance of position), you have to be later than the bully here in case he does call your reraise. You simply cannot be acting first after the flop, particularly if you have a hand that is at the bottom of your range of “reasonable” hands with which to make this move. 3. No one else is going to enter the hand. This is probably the most crucial factor to consider, as you cannot reasonably expect to drop the Hammer successfully when a third player decides that pot odds make a cold call of your reraise the right play. If a player between you and the bully decides to rereraise, then you make like a tree and get the heck outta there (unless you hold kings or aces, of course). But you cannot allow a third player to call you here. This means knowing something about the tendencies of the players sitting in between you and the bully and betting the right amount to keep them out. Even knowing these criteria, I generally find dropping the Hammer a difficult move, especially in tourneys. I’ll do it in my low limit ring games where the stakes aren’t as high (and where I’m generally more aggressive myself). However, in tourneys I find it hard to grab the dude under the arm, yank him to his feet, and tell him what I’ll do if he tries anything funny again. Image: A standard household claw hammer, public domain. Okay, move it on out. You've seen 'em all . 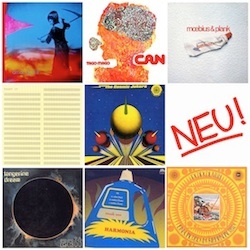 . . now, check 'em out yer selves and tell me what you think. Images: Card Club on Lord Admiral Radio, Ante Up!, CardPlayer’s The Circuit, Rounders, the Poker Show, Expert Insight (Phil Gordon). 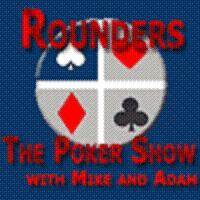 Thought it time to round up some current poker podcasts and bring 'em in for questioning. 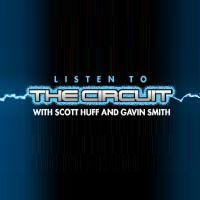 The line-up is as follows (ordered alphabetically): All-In Poker, Ante Up!, California Poker Radio, Card Club on Lord Admiral Radio, CardPlayer's The Circuit, Full Tilt Poker's Tips From the Pros, Netbettor, Phil Gordon's WSOP Poker Podcasts, Poker Diagram, and Rounders. Okay, you five . . . outta here. Bring in the others. Come back and learn how they made it through the interrogation tomorrow . . . . Images: PokerDiagram, Full Tilt Poker, California Poker Radio, Netbettor, All-In Poker.